To support the Hotel Industry Transformation Map, STB has used the Business Improvement Fund to support over 70 projects where hotels tap on the fund to implement manpower-lean solutions in areas such as housekeeping, front office and F&B. STB has been promoting the SkillsFuture Earn and Learn Programme (ELP) for the hotel industry, in order to support building a strong pipeline of talent for the industry. As of December 31 2016, a total of 65 students from Polytechnics and ITE have been employed by 53 different hotels across Singapore in the ELP. In the area of business transformation, the National Association of Travel Agents Singapore (NATAS) has partnered with SIMTech to conduct a training and mentorship programme by SIMTech called OMNI-LITE, which helps members to revise and update their business processes. Later this year, STB and NATAS will also introduce a Business Transformation Playbook that will help travel agents understand different business models and seek ways to improve their own. Travel agents will have a Travel Agent Innovation Challenge later this year to catalyse new technology solutions for the industry. In preparation for the Challenge, STB and NATAS consulted close to 20 travel agents and 250 consumers, through a design thinking project, to identify key problems that travel agents face today. These will then be channeled into the Innovation Challenge to uncover potential technology solutions. In addition to working with and supporting the local tourism industries, STB is building two platforms that would harness technology and data to support future growth. The first platform is an information and services hub, efficiently connecting tourism product owners and suppliers with global distributors, to support the sharing and exchanging of their offerings to a much wider audience. The launch of the Tourism Information Hub (TIH) by the end of 2017 will create a powerful, real time B2B information/content exchange that not only brings about benefits for the tourism businesses but also ultimately benefits consumers who can get instant access to quality information. 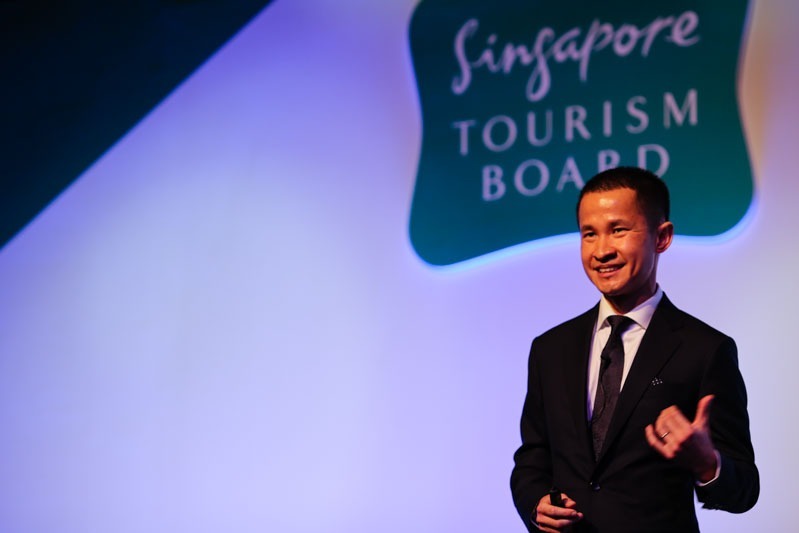 The second platform involves data and the use of data analytics – STB has just launched their Singapore Tourism Analytics Network (Stan) for internal use, which will eventually be rolled out to industry partners as well. In the course of studying tourist movement through aggregated visitor geo-location data, the STB team discovered that around 10% of foreign visitors switched hotels during their stay. For those who stayed 6 days or more, 30% of them switched hotels during their stay. Among the top markets which switched hotels, South Koreans switched to higher tier hotels towards the end of their trip, which often included a stay at the Integrated Resorts. Visitors from India and the Philippines on the other hand, were more likely to switch within similar tier hotels. Mr. Yeo mentioned that with just a single data source such as geo-location, interesting insights can be derived about the patterns and movements of foreign visitors, which will in turn help hoteliers and travel agents to customise services and incentives for these visitors. He encouraged industry partners to share relevant data in order to enrich STB’s geo-location insights and make them more actionable. STB, Changi Airport Group and Singapore Airlines are renewing a joint partnership, which saw the three parties together to invest $20 million over the last two years to market Destination Singapore. This partnership produced good results by raising destination awareness, enhancing post-arrival experience and driving visitor traffic to Singapore. In Japan, STB signed an MOU with JTB Corporation in February 2017. This was the first time that JTB Corporation has signed an MOU with an overseas national tourism organisation (NTO). Tourism enterprises will benefit from added exposure as a result of being part of the nation-wide JTB destination campaign. In addition, enterprises who are part of JTB’s packages will see increased market penetration of their products, as the package will be sold at over 5,800 retail outlets across Japan. In Australia, STB signed an MOU with Flight Centre Travel Group, which is the largest retail travel outlet in Australia and has presence internationally. This partnership is active across five markets, namely Australia, UK, US, Canada and New Zealand. Specifically, in Australia for 2017, STB will work with the Group’s brands such as Flight Centre, Escape Travel, Cruiseabout and Travel Associates to develop campaigns for 700 retail outlets across Australia. When it comes to marketing Singapore, STB wants to support industry efforts which help to promote the Singapore brand. Mr. Yeo announced the launch of STB’s Marketing Innovative Programme in which S$1 million funds have been set aside to amplify and broaden the reach of the industry’s marketing efforts in 2017. All brands with creative and innovative marketing campaigns that also feature a great Singapore story are welcome to apply for the Programme. At the precinct level, STB has been working with URA, LTA and the private sector to explore ways of enlivening Orchard Road into a vibrant lifestyle and shopping destination with a signature street experience in a city garden. In addition, STB is working with private stakeholders to enhance diversity in Orchard Road. STB, SPRING and JTC will launch a Design Incubator at Orchard Green by end 2018. It will house a retail showcase as well as an incubation space for local design talents. The retail showcase will present over 40 local brands on a rotational basis, with a focus on new-to-market and emerging designers ranging from fashion and accessories to small home furnishings and souvenirs. In addition, visitors can look forward to a regular line-up of in-store events that will showcase the work of Singapore’s local design community as well as outdoor events held in conjunction with key leisure activities in Singapore. STB and the Walt Disney Company Southeast Asia (Disney) today announced a three-year partnership, aimed at providing unique and fun experiences themed around Disney’s biggest brands and most popular stories and characters. This collaboration is the first-of-its kind between Disney and a NTO in Southeast Asia. In celebration of the 40th anniversary of Star Wars in 2017, the collaboration will kick off with STAR WARS DAY: MAY THE 4TH BE WITH YOU Festival, a three-day Star Wars festival held at Gardens by the Bay, followed by the other exciting Star Wars-themed activations held in the second half of 2017. Mr. Yeo summarised that the journey towards Quality Tourism is one that carries enormous significance to Singapore. Tourism development has always been an important component of Singapore&apos;s overall national and economic development. It is not just one way in which Singaporeans earn a living in this world. It is also a key way in which Singaporeans can build the best home for themselves, one that has wonderful leisure options and provides good jobs for the economy.